(C) Geomancy.net 2018 : When the Buying Stops, The Selling Can! 1.1. 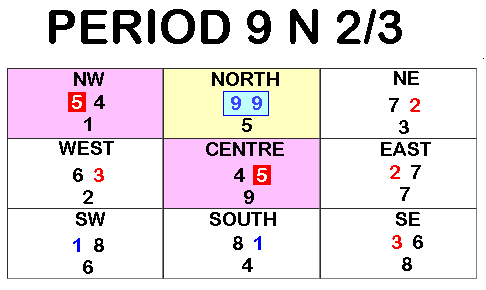 North or the frontage has the very auspicious double auspicious #9's current prosperity wealth stars. 1.2. It is good if this frontage has a pool of water at it's frontage especially if this is a condo/EC. 1.3. If no water, may consider adding a water position at this frontage to enhance wealth luck. 2.1. Usually, for a North facing frontage; often the living room or the master bedroom will be either at NW or NE sector. 2.2. NW sector has a Mountain star #5 = misfortune/sickness. Thus, better that this nasty star is not locked-up in the master bedroom. 2.3. NE sector has a #2 sickness with #7 weak metal element. The #7 can help to further weaken the #2 sickness star. Thus this sector is much, much better as a bedroom than NW sector. 3.1. The centre-point of the unit has a nasty Mountain Star #5 = misfortune/sickness. 3.2. Good if the centre of the unit is a house-hold shelter or a passageway leading towards the bedroom. 3.4. Try to avoid open or clear space at the centre-point of the home. Here, it is preferred that the #5 is locked up. 4.1. SW has the Mountain Star #1 = coming prosperity. Good if the main door is located at this sector. 5.1. Not an issue with the kitchen, yard or air-con ledge located at the rear of the unit. 6.1. Best to balance these sectors for better luck.